Canyonlands National Park is an underrated park located near Moab, Utah. 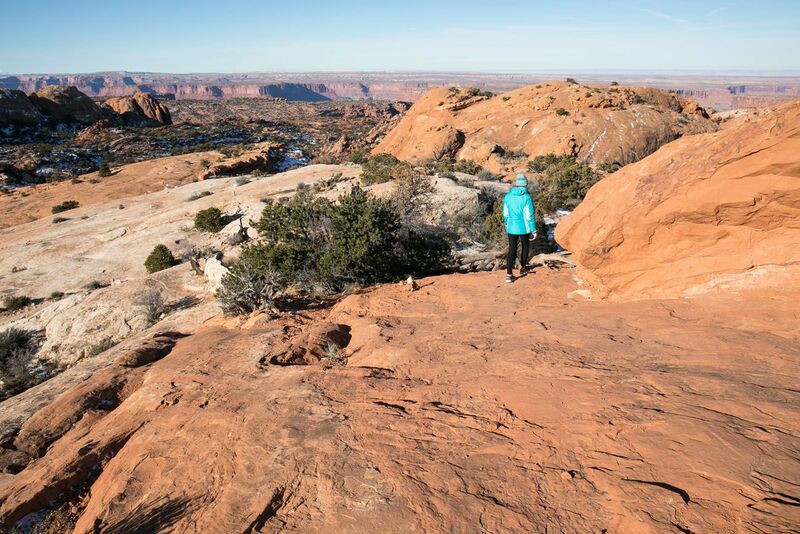 Compared to its smaller and more popular neighbor Arches National Park, Canyonlands feels more rugged, more remote, and a whole lot larger. 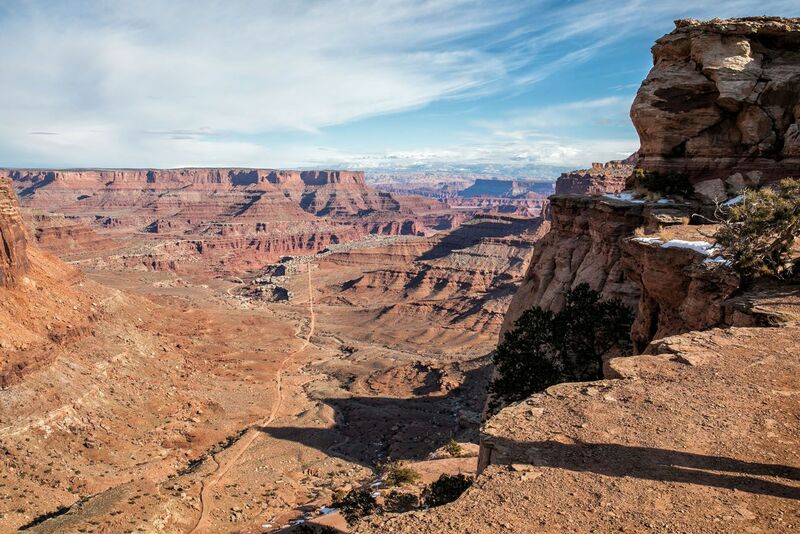 Island in the Sky, the most popular section of Canyonlands, is filled with jaw-dropping vistas and short but sweet hiking trails. 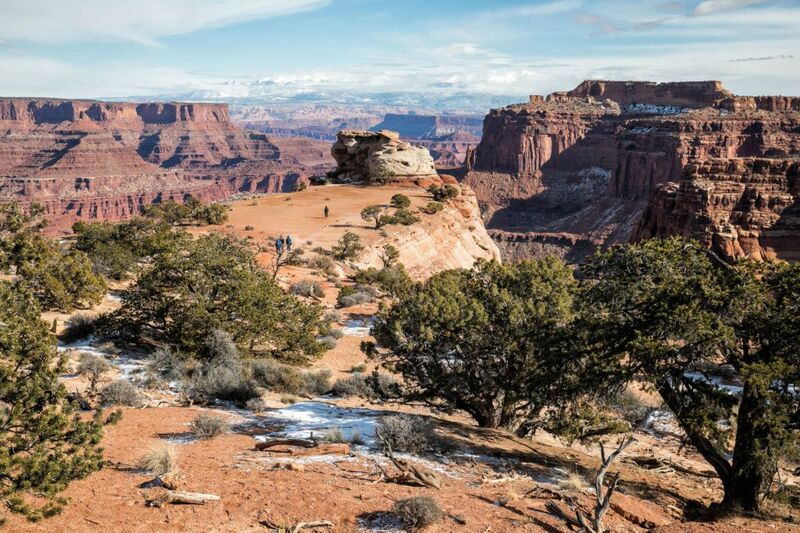 Here are the best things to do in Canyonlands National Park. 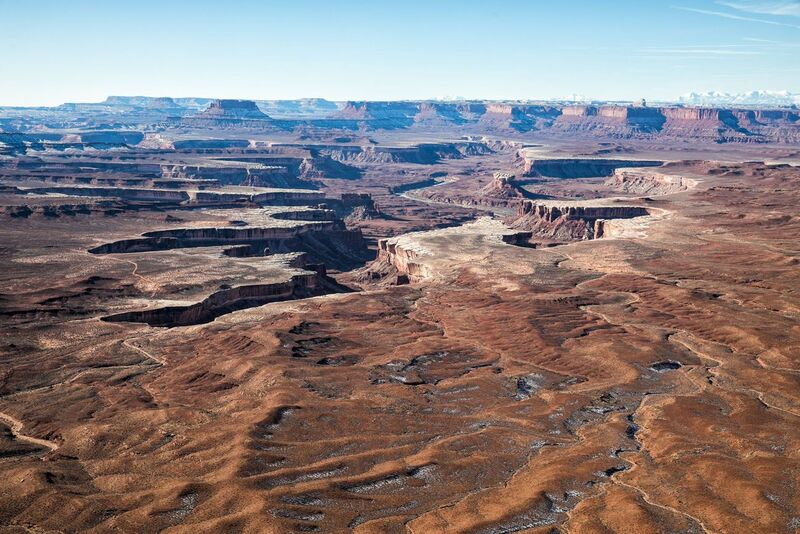 Canyonlands National Park is enormous in size. 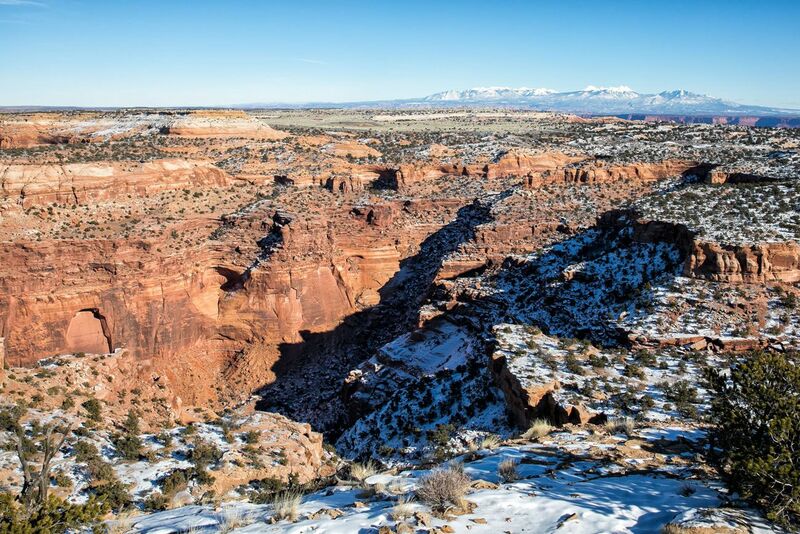 Over 330,000 acres are filled with canyons, arches, buttes, mesas, dirt roads, hiking trails, campgrounds, and overlooks. Most visitors barely scratch the surface of what there is to see and do in this park. With literally hundreds of miles of hiking trails and dirt roads that are only accessible by 4×4, you can spend weeks here exploring the backcountry. 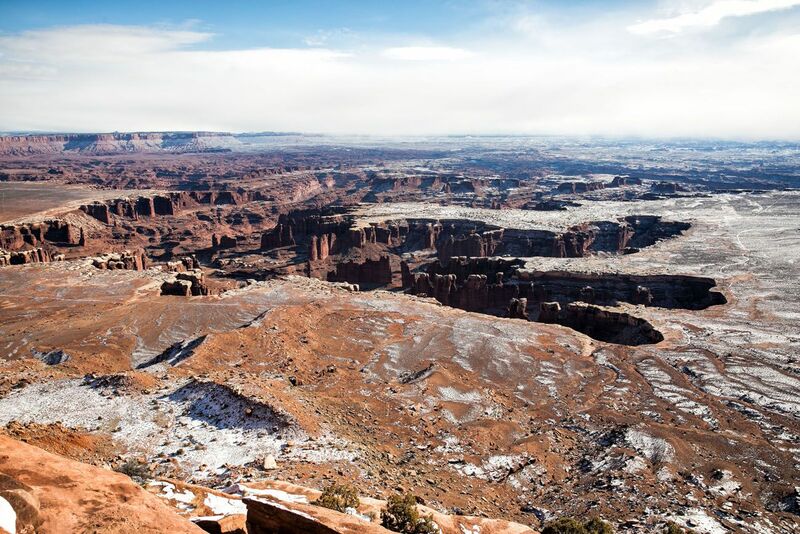 There are three districts in Canyonlands National Park. 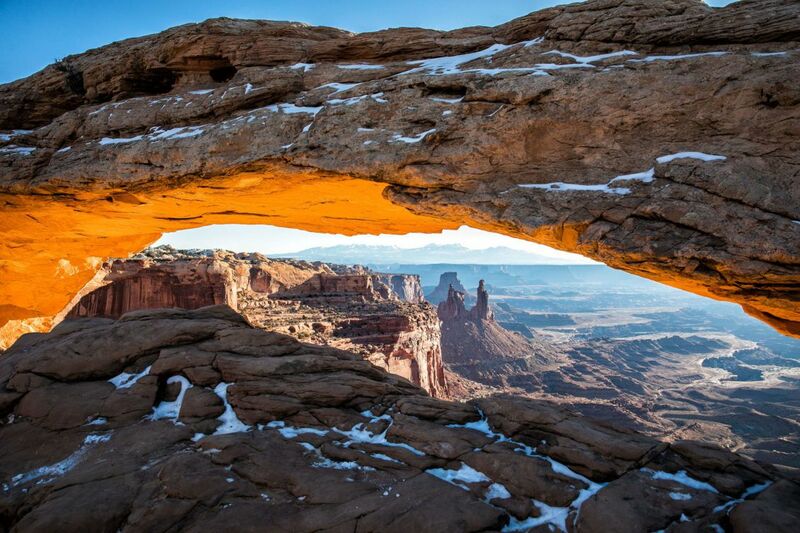 This is the most visited section of Canyonlands National Park. Filled with stunning overlooks and a nice mix of easy and difficult hiking trails, the Island in the Sky district gives visitors a nice overview of the park. One day is just enough time to visit the best overlooks and hike a few of the shorter trails. This article focuses solely on the Island in the Sky district. “Just around the corner” from Island in the Sky is The Needles. Uniquely shaped sandstone rock formations create stunning landscapes. Go here for great hikes, more scenic views, and to escape the crowds that flood Island in the Sky. Getting Here: The Needles is less visited than Island in the Sky because of its location. It sits right next to Island in the Sky, but access is from US-191. From the Island in the Sky Visitor Center, it is a 2-hour drive (106 miles). Moab is a little closer, but it still takes an hour and twenty minutes to drive here (74 miles). 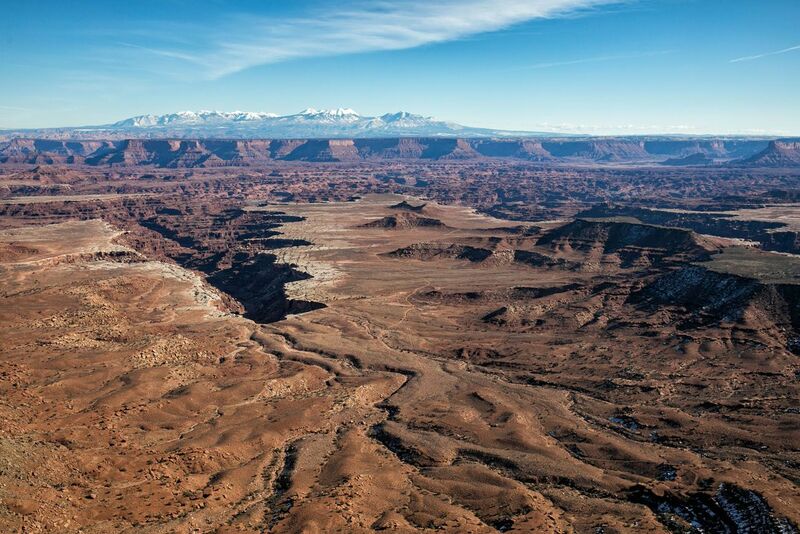 The Maze is a remote area of Canyonlands that is only accessible by 4×4. To explore this area of the park, backcountry experience and self-sufficiency is a must. 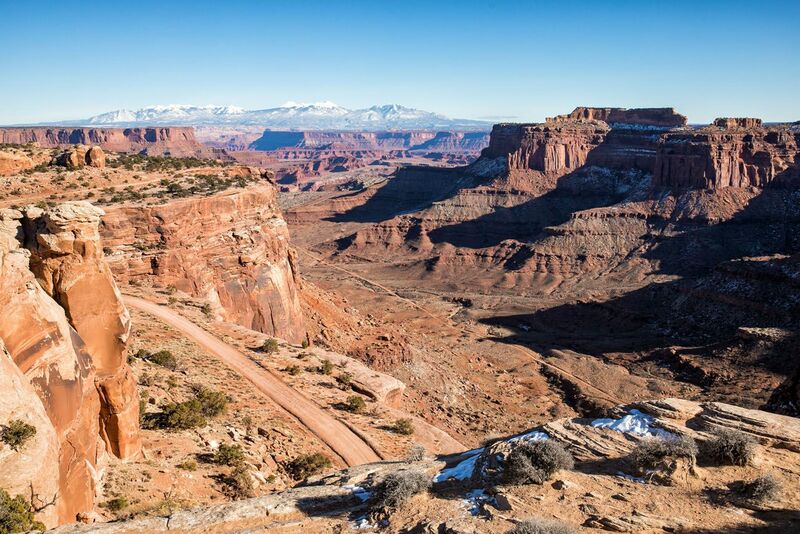 When you visit the Island in the Sky district of Canyonlands National Park, you can see the best of the park as you drive on the main roads and stop at the scenic overlooks. However, there are several spots where you will need to do a little hiking. The only way to see the famous Mesa Arch is on your own two feet. And there are several more short but amazing hikes we recommend along the way. I organized this list into two categories: best overlooks and best hikes (you can see them all on a map at the end of this article). Let’s start with the overlooks. 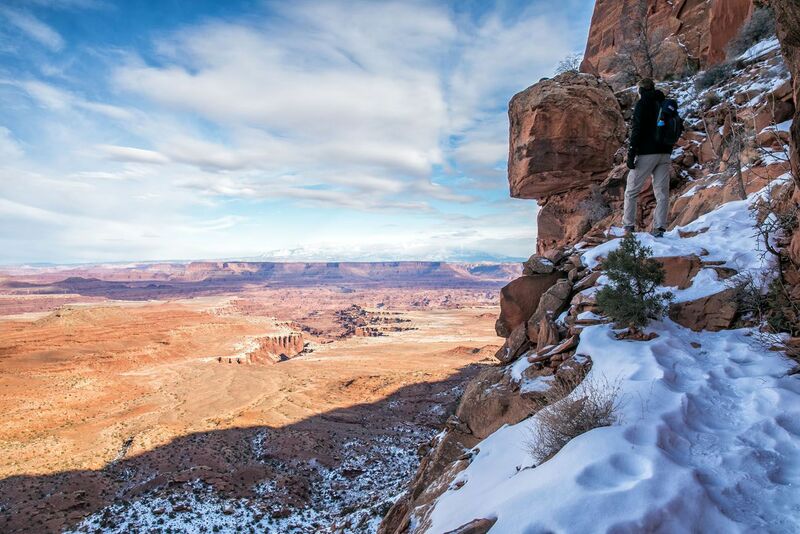 Canyonlands wastes no time trying to impress first-time visitors. One of the best views in Island in the Sky is located just across the street from the Visitor Center. From the parking lot, cross the street and follow the trail to the wide overlook. Stretching out in front of you is your first jaw-dropping view. Shafer Canyon Road clings to the cliffs just below you and farther off in the distance is White Rim Road. Located just past the Visitor Center, this is another amazing view. It is similar to the view at the Visitor Center, but it is still well worth your time. From here, you can see the crazy switchbacks on Shafer Canyon Road. 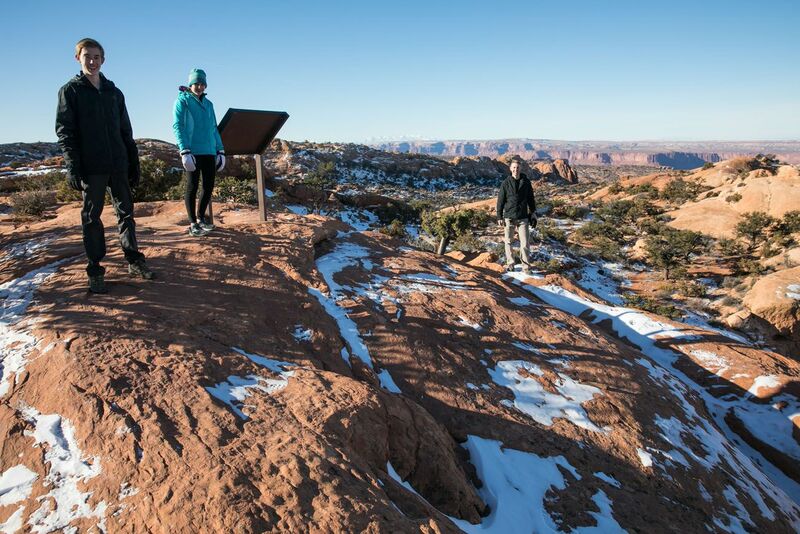 Getting Here: Just past the Visitor Center is a turn-off for the Shafer Canyon Overlook. Park here and walk down to the wide plateau that offers views of the Shafer Trail, a dirt road that is only accessible if you have a 4×4. 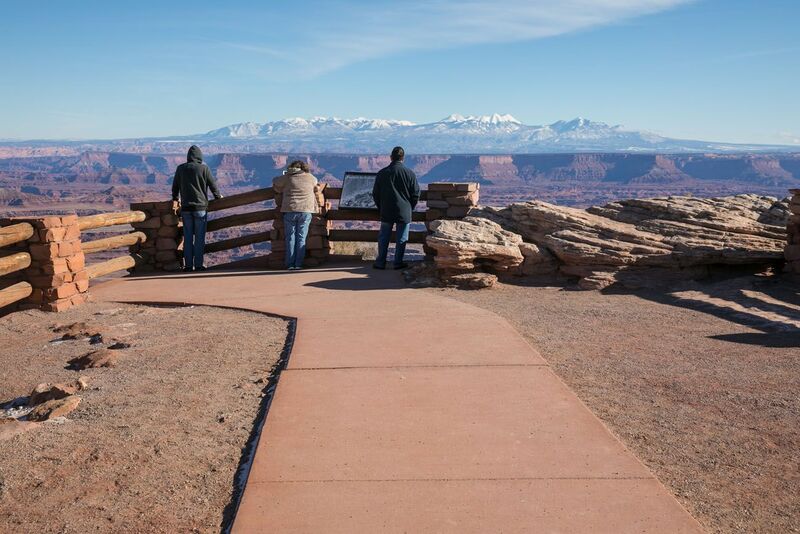 There is a second viewpoint called Shafer Trail Viewpoint. Park in the very small car park on Grand View Road to get an even closer view of Shafer Trail. Aptly named, this overlook is a top contender for the best view in Island in the Sky. Stretching out in front of you is a deep canyon that was carved out by the Colorado River. Does anyone else think this looks like a giant dinosaur footprint on the ground? Getting Here: Grand View Point is located at the very end of Grand View Point Road. Park in the large car park and then it is just a short walk on a paved trail to the viewpoint. This is a very popular viewpoint so it might be difficult to find an empty parking space. From the edge of the mesa, get panoramic views out to the canyons formed by the Colorado River. 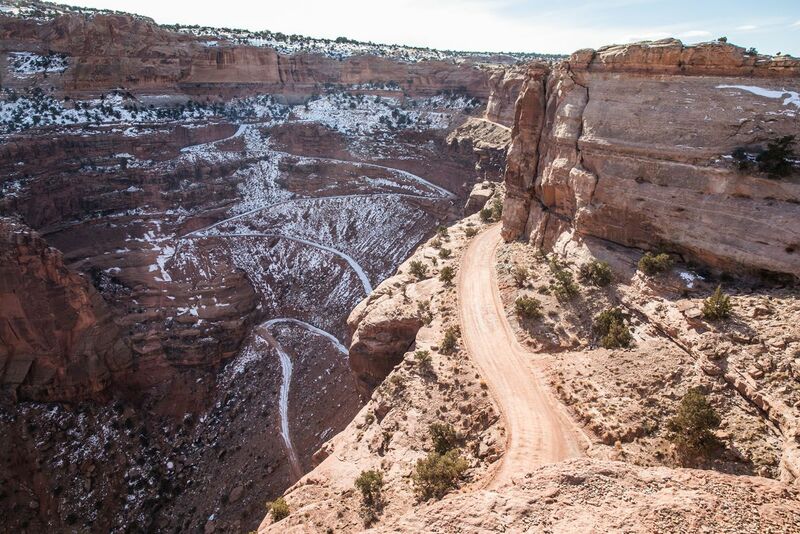 See if you can spot the White Rim Road, the 4×4 road that winds its way along the plateau. Getting Here: This overlook is located on Grand View Point Road. Park in the car park and it is a very short walk to the overlook. 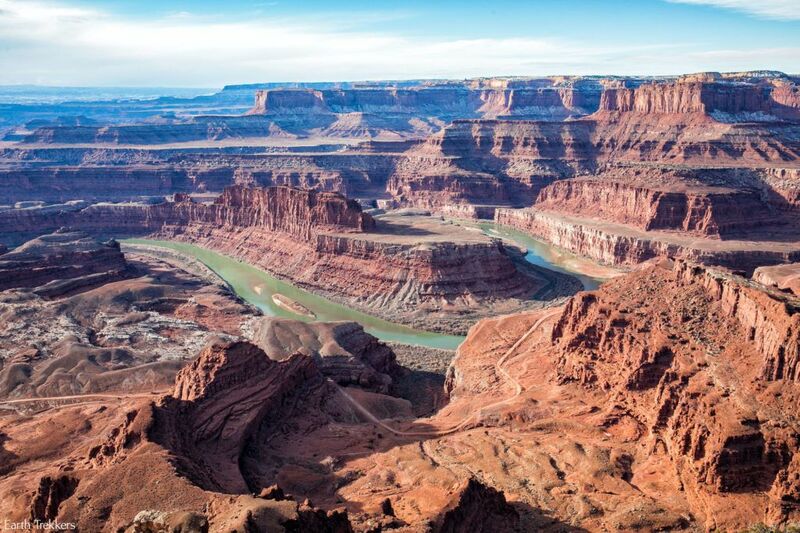 It took two rivers to carve out the canyons that create these amazing landscapes in Canyonlands National Park. 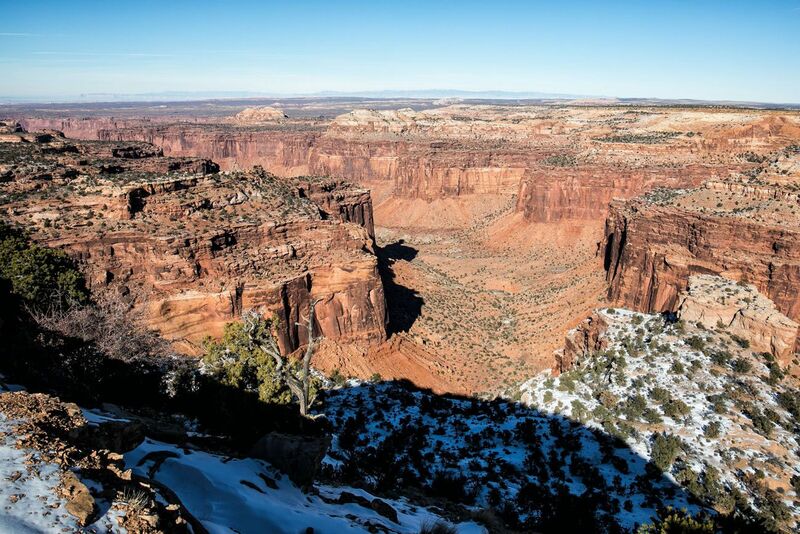 At this viewpoint, you look out over the canyons formed by the Green River. Getting Here: The turn-off for Green River Overlook is located on Upheaval Dome Road, just past the junction with Grand View Point Road. There is a large car park here (and restrooms). It’s a short walk on a paved trail to the viewpoint. 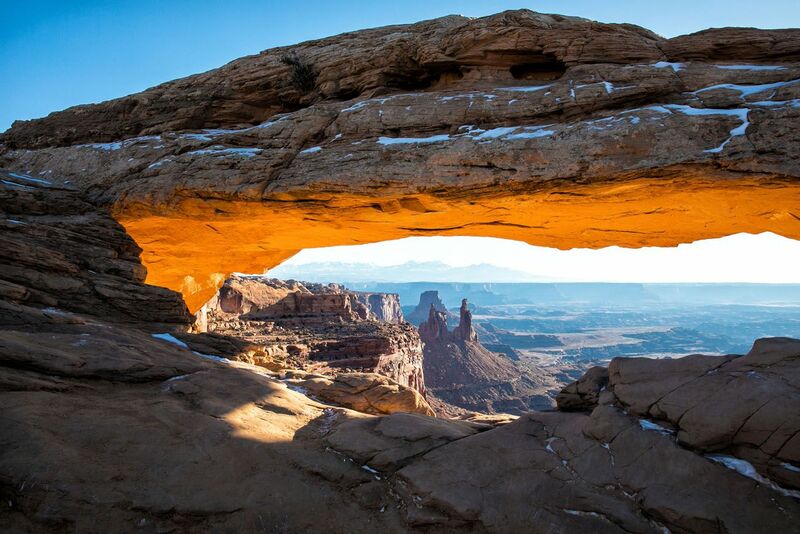 Mesa Arch is one of the most photographed spots in Canyonlands National Park. Famous for its unique lighting at sunrise, this is a very popular spot for tripod-wielding photographers first thing in the morning. However, this is also a busy spot all day long. During the two days we spent in Canyonlands the parking lot was always filled. To get to Mesa Arch, it is a half mile hike round trip. It’s an easy walk on a graded gravel and dirt path up and over a small hill to get to the arch. A visit here lasts 30 minutes, longer if you are here to photograph the sunrise. Getting Here: There is a car park located right on Grand View Point Road. From the Visitor Center, it is a 10-minute drive to get here (6 miles). From the Grand View Point Overlook, you can walk along a trail that travels along the edge of the mesa. It is an easy walk that offers spectacular views across the canyons. Getting Here: The trailhead is located at the Grand View Point. 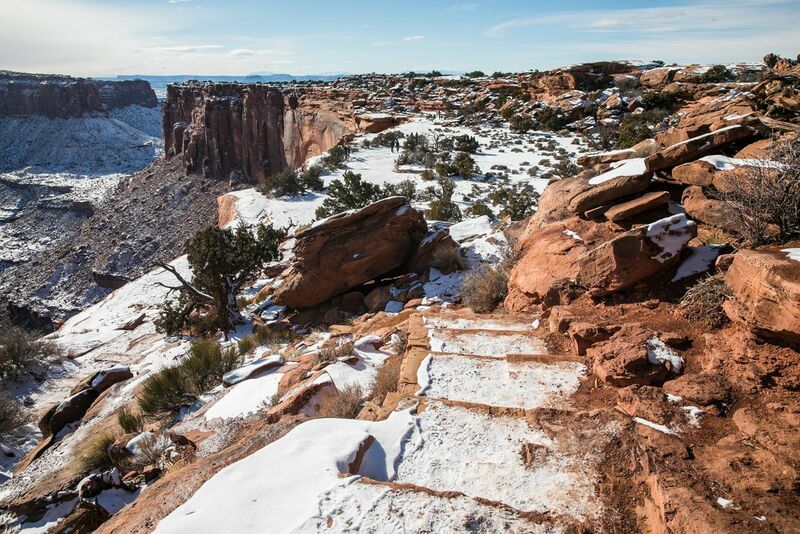 This is our favorite short hike in Canyonlands National Park. Why? It’s short, it’s easy, and you get one of the best views in the park. The views from Grand View Point and Buck Canyon Overlook are amazing. 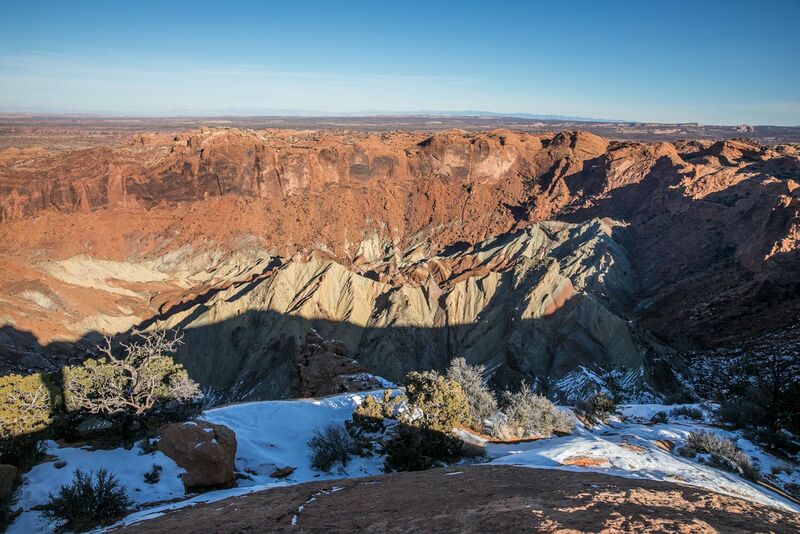 White Rim Overlook takes these two views and combines them into one jaw-dropping viewpoint. From the tip of the mesa, you get panoramic views of the canyons carved out by the Colorado River. And since you have to hike to get here, there are a lot fewer people than at Grand View Point and Buck Canyon Overlook. Worth it? Absolutely! Getting Here: Parking is extremely limited. As you travel south on Grand View Point Road, there will be a left turn for a picnic area. Turn here and then park at either a picnic area or at one of the limited parking spaces near the trailhead. This turn off is located 11 miles from the Visitor Center. It is located 0.9 miles north of the Grand View Point parking lot. There are several theories as to what left this crater in the ground. Most likely it is an impact crater formed by a meteorite but some theories suggest this crater was formed when a salty dome pushed its way up through the sandstone rock. Either way, this is a unique spot to explore in Canyonlands since it looks vastly different from the canyons you see from the overlooks. To get here, it is an easy to moderate hike. The trail is well marked. Expect to hike up and down several small hills. The first overlook gives you a nice view of the crater. If you just hike to the first overlook, it is 0.8 miles round trip. As you hike to the second overlook, you have the option to detour to the top of a giant rock. From here, the views really open up. Not only can look down into Upheaval Dome but you get panoramic views of this side of the park. This is the detour. The trail continues to the left but we hiked up this giant chunk of rock for the best views of this hike. The view over Upheaval Dome is nice but I love this view! The snow adds a nice touch. Getting Here: Park in the car park at the end of Upheaval Dome Road. 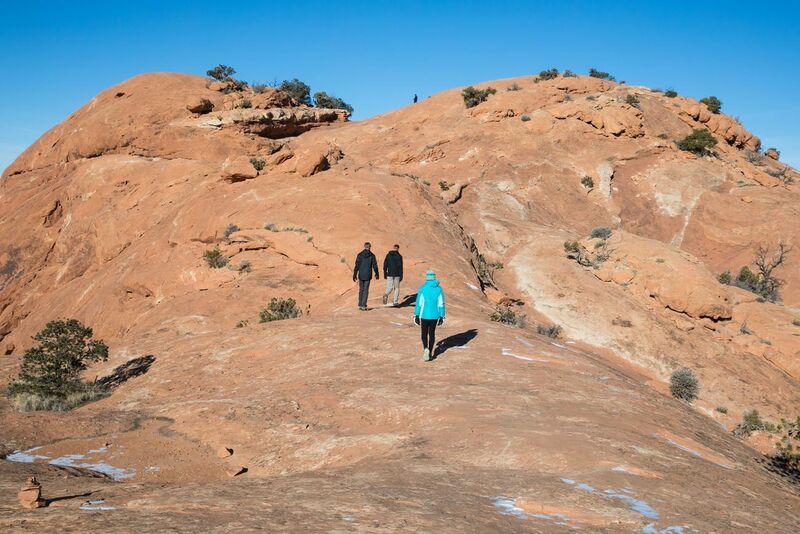 This quick hike features panoramic views and the chance to hike on bare slickrock. It’s a short but strenuous climb to get to the top of the rock but once there you have great views across the park. Getting Here: Park in the small car park on Upheaval Dome Road. The parking lot is located just before the parking lot for Upheaval Dome. 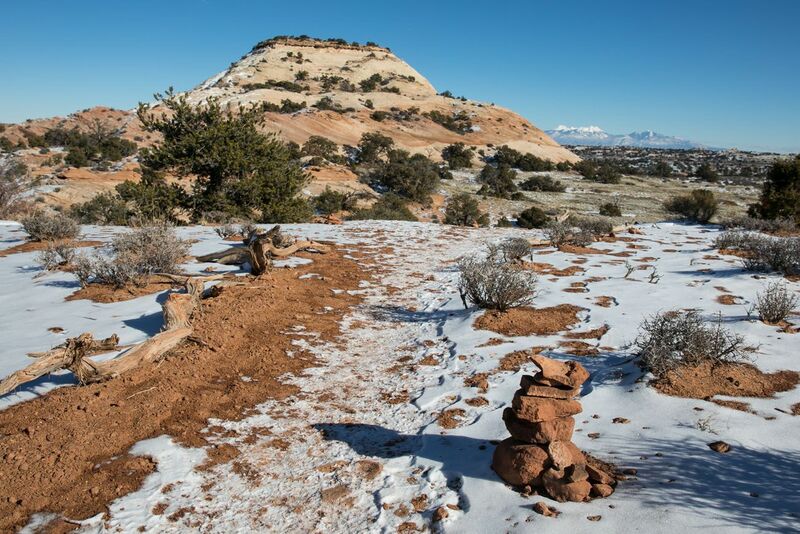 The cairns (the stacked stones) mark the trail up Aztec Butte. 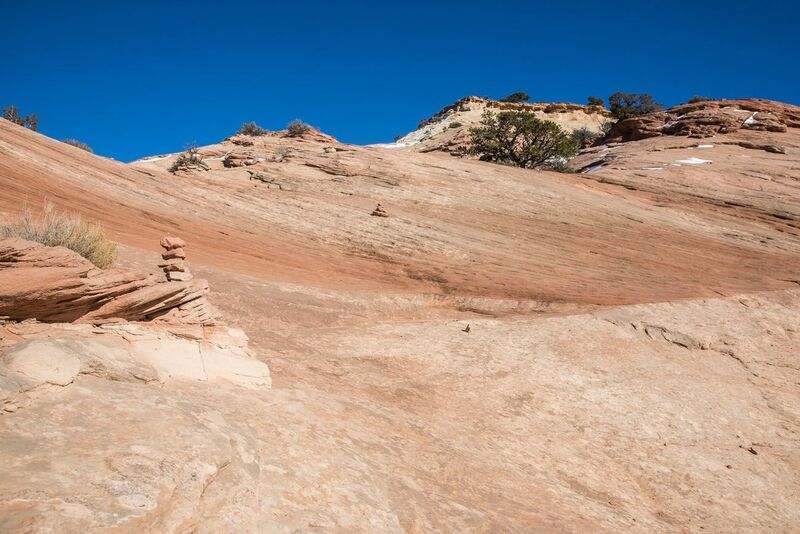 Similar to Whale Rock, this hike features more slickrock and panoramic views. Along the way, take the short spur trail to see ancient granaries. Getting Here: The parking lot is located on Upheaval Dome Road. 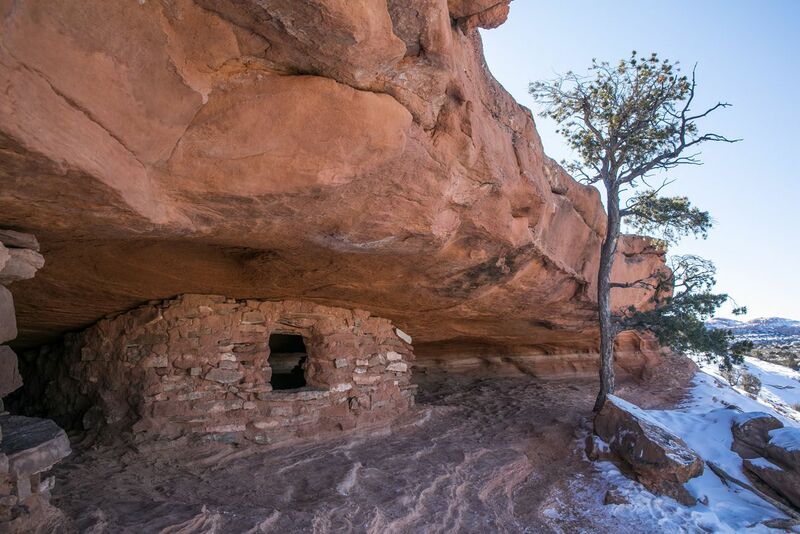 In addition to our best things to do in Canyonlands list, we have two more hikes for you to consider. These are longer and will take up a nice chunk of your day, but these are great ways to go beyond the overlooks and short hikes to see more of the park. 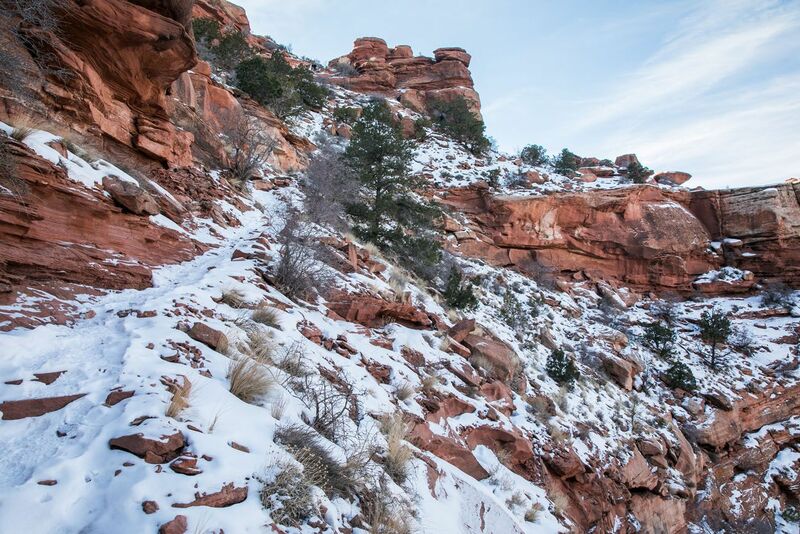 On this hike, you walk on rugged and rocky trails around Upheaval Dome. You need to have some experience with route finding since the trail is not well marked. Areas of rock scrambling, steep inclines, and route finding make this hike challenging. Getting Here: Park in the car park for Upheaval Dome at the end of Upheaval Dome Road. Journey below the level of the rim and hike out to the edge of one of the canyons formed by the Colorado River. This hike features a crazy steep descent to get down to the level of the plateau. And since this is an out and back hike, you will have to climb back up the steep wall of rock. However, the views are gorgeous on the way down and there is something special about journeying below the rim in the Island of the Sky. 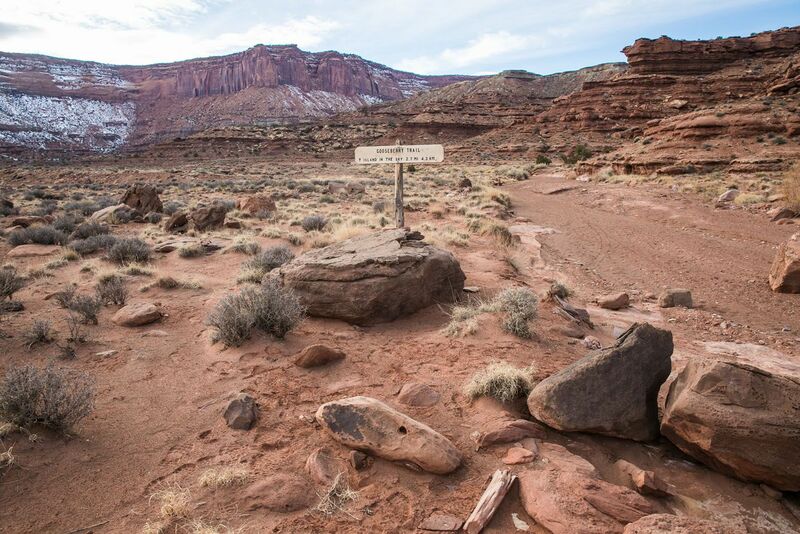 Getting Here: The trailhead for the Gooseberry Hike shares the same trailhead for the White Rim Overlook hike. How to Use This Map: Click the tab in the top left hand corner of the map to view the layers (best overlooks and hiking trails). You can click the check marks to hide or show layers. If you click the icons on the map, you can get more information about each point of interest. 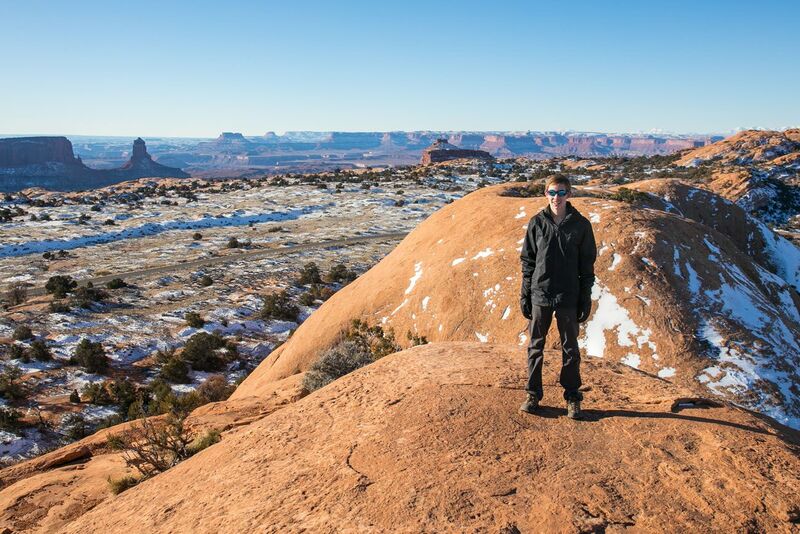 We spent two days in Canyonlands at the very end of December. It snowed the day before our visit so some roads and trails were covered with snow. Since it was a holiday week, car parks were often filled but even so, it didn’t feel overly crowded. Daily high temperatures hovered in the mid-20’s during our visit. We wore winter coats, hats, and gloves and with the cold weather gear we felt fine. Since we did a mix of overlooks and short hikes, we would warm up in our car during the short drives through the park. 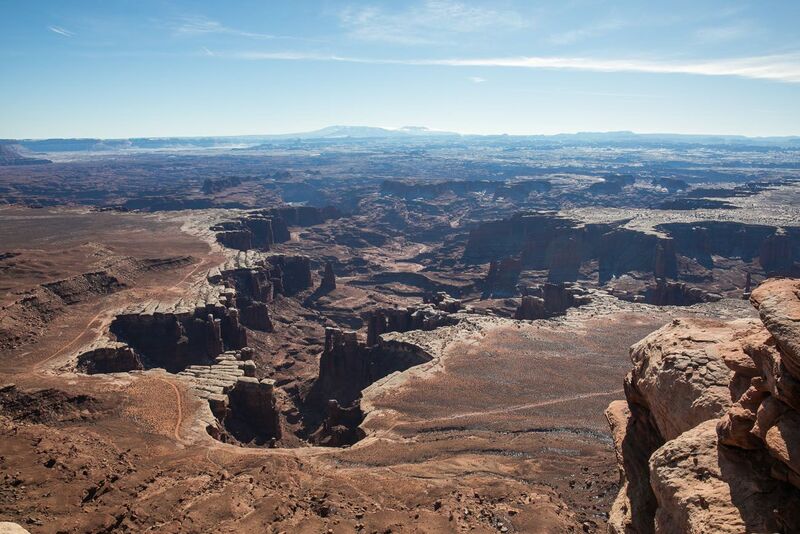 Getting to Canyonlands Island in the Sky: The Island in the Sky district of Canyonlands National Park is located in southeastern Utah. The closest town is Moab. 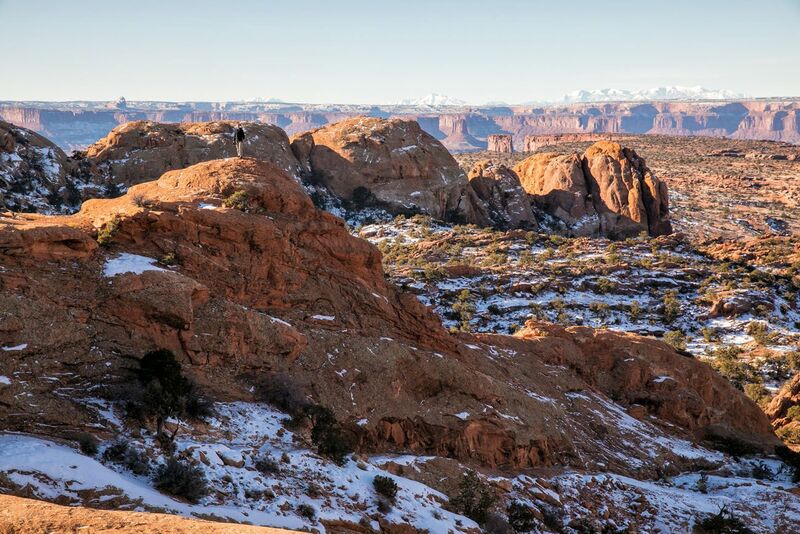 From Moab, it is a 45-minute drive to get here (33 miles). 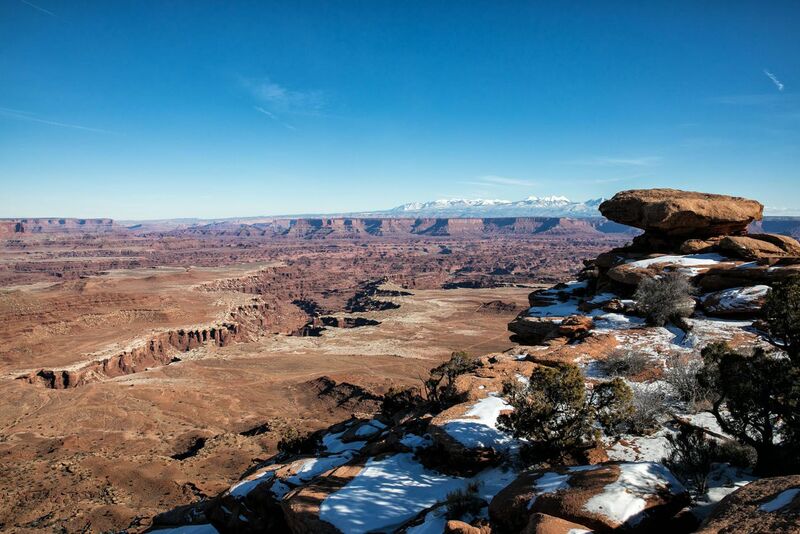 Best Time to Go to Canyonlands: The spring and fall months are the best times to visit. Weather conditions are pleasant and you can avoid the big crowds that flood the park in the summer. During the summer months, expect soaring temperatures, large crowds, and difficulty finding parking at many viewpoints. During the winter months, it is much less crowded, but temperatures get below freezing and snow is likely. Entrance Fees: It costs $30 per vehicle to enter the park and this is good for seven days. 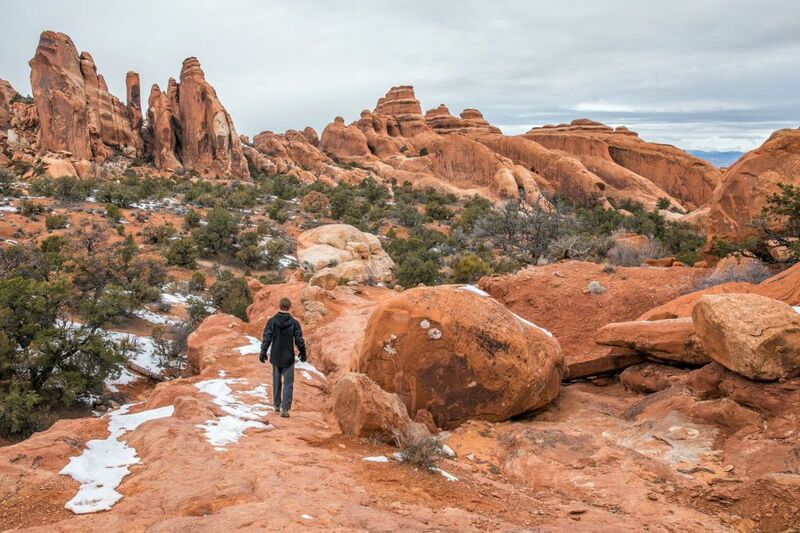 For $55 you can purchase a Southeast Utah parks pass, which also gets you into Arches National Park. You can also purchase an annual National Parks pass (called the America the Beautiful Pass) for $80. With this pass you can visit over 2,000 federal recreation sites. 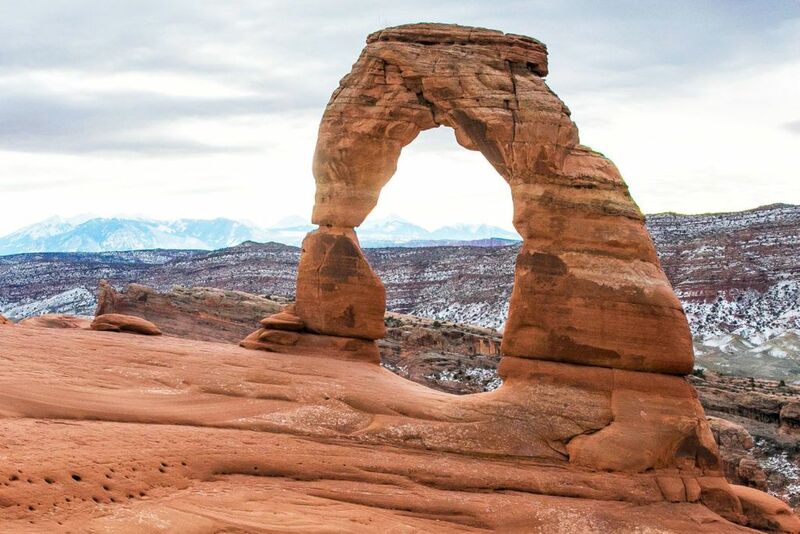 This is worth it if you also plan to visit more of Utah’s Mighty 5, including Arches, Capitol Reef, Zion, Bryce Canyon, or any other US National Park within the year. There are no restaurants in the park. If you plan to stay all day you will need to pack a picnic lunch. However, there are restrooms at many of the main viewpoints and trailheads inside of the park. Don’t expect the cellular service on your phone to work. Occasionally we got a weak cellular signal on our phone but for the most part they were useless until we started the drive back to Moab. 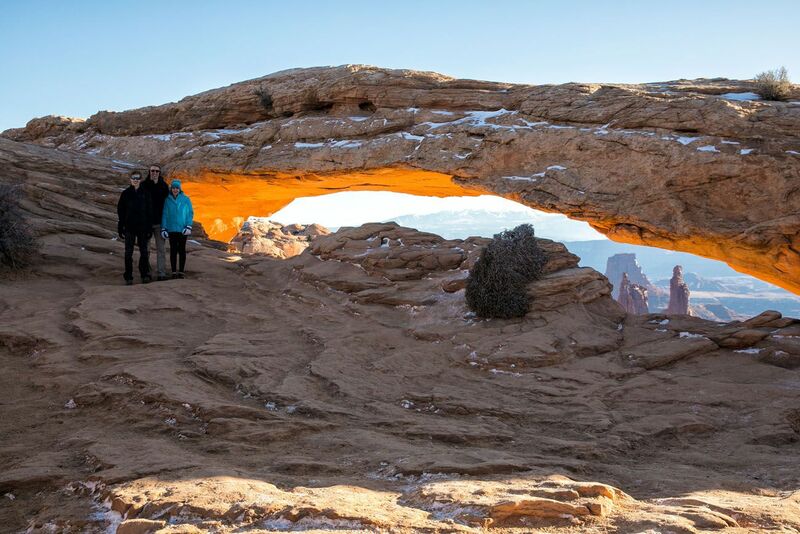 Learn how to see the best of Canyonlands in our article One Perfect Day in Canyonlands National Park. We stayed at 57 Robbers Roost in Moab. This small building has five apartments of varying sizes to choose from. We stayed in apartment #5, the penthouse apartment with three bedrooms, three bathrooms, a full kitchen, and a living room. It was a little larger than what we needed but having the extra space and the kitchen was wonderful. We could cook breakfast before touring the parks and we had lots of space to spread out in after a day of hiking. This was perfect for us, especially because the sun set at 5:15 pm during our visit. On a return visit to Moab we plan to stay here again. 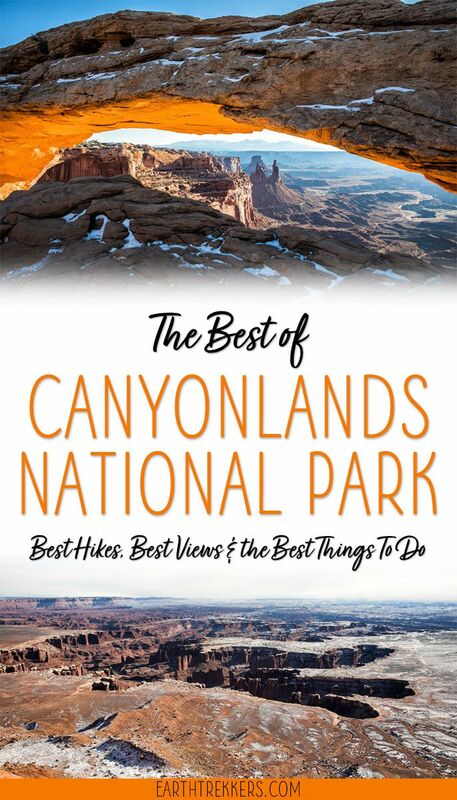 Are you planning a trip to Canyonlands National Park? If you have any questions, comment below! Arizona: Antelope Canyon: Should You Visit Upper or Lower Antelope Canyon?